Seven’s Live coverage of the 2017 Brownlow Medal delivered the network a huge share, although it was not quite enough to topple The Block. 1.09m viewers watched Dustin Martin win the AFL medal, with 654,000 of them in Melbourne. The Block pulled 1.12m viewers, down on last Monday’s 1.33m but still topping demos. 7:30 followed at 648,000 then Australian Survivor which was up at 625,000 -higher on a single channel than on 3 on Sunday night. Excluding Brownlow coverage Have You Been Paying Attention? led from 9pm but was down on last week. ABC also saw a drop without Q&A while a 1994 movie did little for Nine. Seven network won Monday with 39.6% then Nine 23.8%, TEN 16.2%, ABC 14.0% and SBS 6.4%. Brownlow Medal (1.09m / 675,000) topped Seven’s night followed by Seven News (1.03m / 1.01m), Home and Away (578,000 in 3 cities), The Chase (537,000 / 362,000) and Highway Patrol (384,000 /376,000 in 3 cities). World’s Angriest was 285,000. The Block was #1 with 1.12m for Nine then Nine News (997,000 / 978,000), A Current Affair (859,000), Hot Seat (497,000 /298,000) and Movie: 4 Weddings and a Funeral (285,000). Australian Survivor (625,000) led for TEN then Have You Been Paying Attention? (579,000), The Project (559,000), TEN Eyewitness News (433,000) and Family Feud (327,000). Life in Pieces was 187,000. ABC News (734,000), 7:30 (648,000), Australian Story (642,000), Four Corners (432,000), Media Watch (324,000), Grand Designs (204,000) and Unconquered: The Invictus Games (165,000). On SBS it was London’s Super Tunnel (223,000), Michael Mosley: Do We Really Need Health Tests? (209,000), SBS World News (159,000) and 24 Hours in Emergency (141,000). Shaun the Sheep showed up multichannels with 233,000. OzTAM Overnights: Monday 25 September 2017. That’s a really tough night for TEN. Without much competition this year Survivor has really struggled in the ratings and HYBPA has softened a lot. I wouldn’t read too much into HYBPA’s numbers last night up against The Brownlow. Generally it pulls around 700k, which is not bad for a show that rarely gets a good lead in and starts at nearly 9pm some nights. HYBPA has softened in quality as well as ratings. Or maybe I’m just getting bored with the formula. Yes have enjoyed this show on a Monday nite. But , Yes , a lot of the same old same old. Yes we know Tom is old! Yes we know Sam is Asian! In the past Working Dog have curtailed their shows, leaving the audience, wanting more. So the early part of The Chase was not even on the radar last night, very surprising, also think it should be nine with 23.8% not seven. 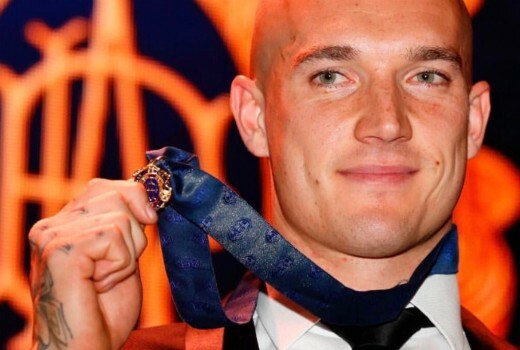 I will never understand the popularity of the Brownlow. From what I have seen through channel flicking, it’s a tediously boring few hours of numbers being called until one person wins a medal that’s only slightly larger than a thumbnail. Surely they could incorporate Bingo into this number calling to make it marginally entertaining. Up there with Eurovision voting. At least Eurovision voting only takes about an hour, and has a few hours of song & dance beforehand. As a rabid Richmond supporter, I enjoyed every bloody minute of it! Even as a Adelaide born Collingwood supporter, I want your boys to win on Saturday. Hated both SA teams from Round 19. (I went to the Power match and the big win turned into a draw by the Crows in Round 19. A local SA newspaper has a headline the lines of “Flag now formality” So cocky the SA news. I want their dreams crushed this Saturday. On the contrary, I wasn’t going to watch because it was a foregone conclusion, but was drawn in by the parts I love about the show – the in-betweens: footage of games during the year including lots of bloopers, the other awards (like the charitable one), the Auskickers. I think they balance the numbers announcements well with all of this entertaining stuff. The worst parts were Bruce Mc interviewing players after each round was called, and all the rude WAGS on their phones all over the room. Also, the noise level of chatter while people were on stage was a sad indictment of modern culture where noone listens anymore. I thought last night’s was the most cringe-worthy ever, yet Seven’s highest-rating in some time! Having exclusively from this year (no Fox Footy), Richmond star set to win and turning out to be a closer count than thought all helped. The Block was still massive (obviously down in AFL markets), even if Nine and other networks were absolutely squashed last night. Thought HYBPA would do better, flicked over a bit.